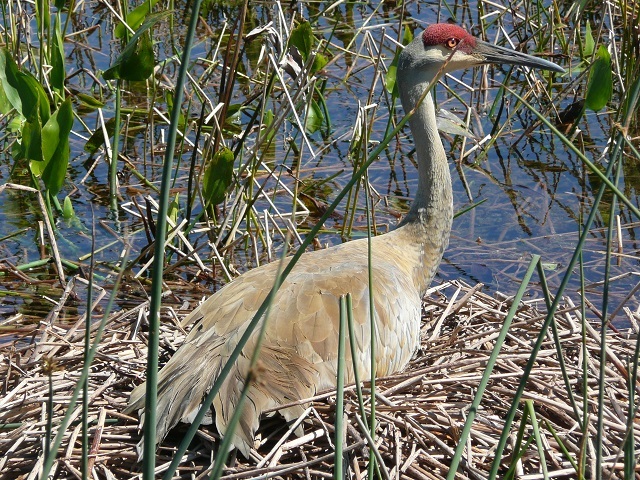 Formerly known as the Indian River County Wetlands Treatment Facility, this bird- and birder-friendly site employs a unique technique to further clean its treated wastewater. After cleaning the water chemically, (which in the past would have been discharged into a river), the water flows instead through a created wetland. Plants like cattail and bulrush remove excess nutrients like phosphates and nitrates, which prevents harmful algae blooms downstream that choke out the native aquatic life. Birders will appreciate the boardwalk, covered pavilion and observation tower on the south side of the wetlands, as well as the diked impoundment trails, which allow easy viewing. 170+ species have been recorded at the facility including Black-bellied and Fulvous Whistling-Duck, Wood Stork, Least Bittern, Roseate Spoonbill, Snail Kite, Limpkin, Purple Gallinule, Caspian Tern, Common Ground-Dove, Loggerhead Shrike, and Painted Bunting. Rare sightings include Cave Swallow and Dickcissel. Sign in at the entrance before birding. Fall through spring will produce the biggest variety of birds but summer birding is productive here; arrive early, as little shade is available. Bring water and sun protection.